At Wickedfood Earth Farm we run a small herd of Dexter cattle, which we slaughter, and process in-house to ensure that we have complete trace-ability of all our meat. All the cattle that we use are veld-raised, and completely free-range, using no routine antibiotics and growth hormones or stimulants. Our animals take on average, twice as long to reach maturity as factory-farmed animals. This means that the muscles of the animals get to work, which ensures added flavour. The Wickedfood Earth Country Cooking School team will showcase real nose-to-tail eating through some very different beef preparation, cooking and presentation techniques, using some of the lesser used cuts. 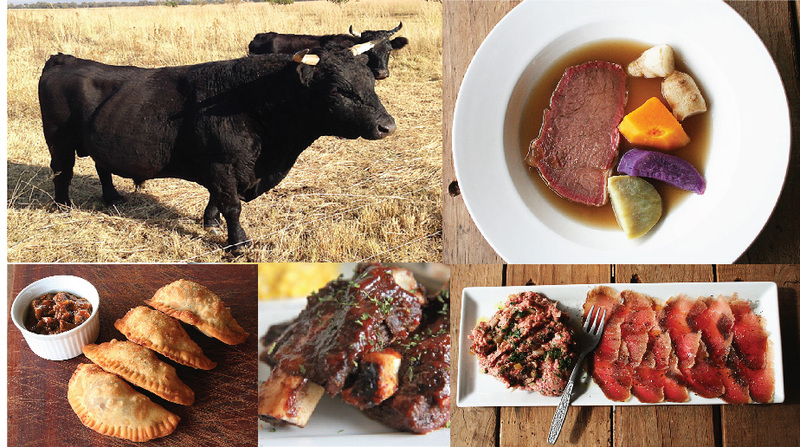 The Cooking School team will prepare a 4-course meal to remember, that you’ll very seldom have the opportunity to sample, combining South African braai techniques, with long slow BBQ smoking, slow roasting and braising – a truly once off beef event. Wickedfood Earth Farm & Country Cooking School is proud to be a member of Slow Food Chefs’ Alliance, South Africa. The Alliance is an international network of chefs who are committed to promoting small-scale, locally produced “good, clean and fair” foods, safeguarding agricultural biodiversity at risk of extinction and giving visibility and the proper value to their supplying producers. Space for the Wickedfood Earth Country Cooking School Lunches are limited to a maximum of 30, so book early to avoid disappointment. Guests will have a choice of sitting at the Cooking School’s magnificent communal long table, or for parties of 4, 6, 8 or 10 at their own tables (with enough lead-in time, we can re-create this event for your exclusive group). Up-front booking essential, no booking confirmed without payment in full, no refunds, no children under 16 (terms and conditions apply). Up-front booking essential, no booking confirmed without payment in full, no refunds, no children under 12 (terms and conditions apply). For your own protection, access to the property is only granted to those people with bookings.